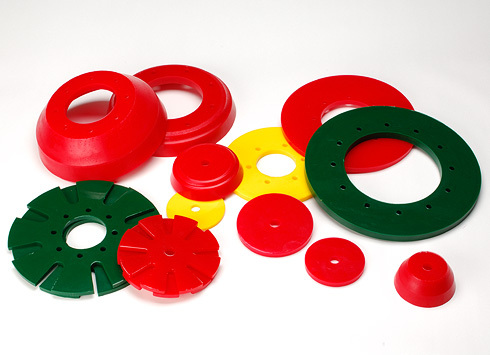 Girard Replacement Cups & Discs are made of the highest quality polyurethane for maximum abrasion resistance, elongation, sheer strength and chemical resistance to assure the best performance under the largest variety of pipeline conditions. Center-hole and bolt-circle dimensions can be customized to fit any pig body on the market, making them the ideal replacement cups and discs. Girard Cups & Discs are designed to maintain a positive seal while also supporting the pig body. Multiple durometers are also available for specific applications. Various styles of both cups and discs are manufactured to traverse pipeline configurations including Long & Short Radius Bends, Tees, Valves, Varying Wall Thicknesses and even Dual-Diameters. Available from 2” to 48” these cups remove debris and liquids while maintaining their seal in varying wall thicknesses and out-of-round pipelines. Available from 2” to 56”these cups aggressively scrape the pipeline while maintaining a good seal. Available from 3” to 14” from light scraping and liquid removal. Available from 2” to 60” provide support for pig body, firm seals and space between Cups and Discs for effective line scraping, cleaning and liquid removal. DUAL DIAMETER DISCS: Information available upon request. NEOPRENE CUPS: Information available upon request.